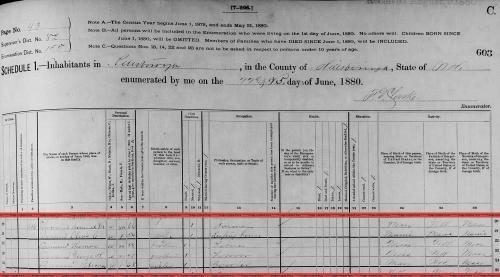 "United States Census, 1850," database with images, FamilySearch (https://familysearch.org/ark:/61903/1:1:MWZL-1J1 : accessed 24 January 2016), Mary Bachelder, North Hampton, Rockingham, New Hampshire, United States; citing family 127, NARA microfilm publication M432 (Washington, D.C.: National Archives and Records Administration, n.d.). "United States Census, 1850," database with images, FamilySearch (https://familysearch.org/ark:/61903/1:1:MWZ2-GXQ : accessed 24 January 2016), Simon Towle, Hampton, Rockingham, New Hampshire, United States; citing family 26, NARA microfilm publication M432 (Washington, D.C.: National Archives and Records Administration, n.d.). "New Hampshire Birth Records, Early to 1900," database with images, FamilySearch (https://familysearch.org/ark:/61903/1:1:FL5P-3NB : accessed 24 January 2016), Zachary Towl, 09 Dec 1746; citing North Hampton, Rockingham, New Hampshire, United States, Bureau of Vital Records and Health Statistics, Concord; FHL microfilm 1,001,049. Howard, Matilda D., widow of John D. house 10 Chestnut. 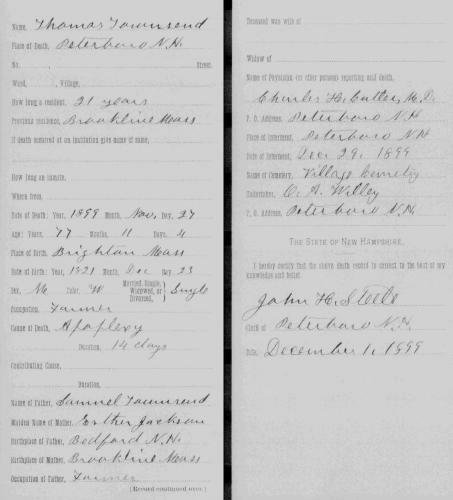 "Massachusetts, Deaths, 1841-1915," index and images, FamilySearch (https://familysearch.org/pal:/MM9.1.1/N7FK-99R : accessed 13 Nov 2012), Matilda J. Howard, 1900. "New Hampshire, Death Records, 1654-1947," index and images, FamilySearch (https://familysearch.org/pal:/MM9.1.1/FSVX-LBT : accessed 22 Apr 2014), George Henry Townsend, 29 Apr 1903; citing Peterboro, , New Hampshire, Bureau Vital Records and Health Statistics, Concord; FHL microfilm 2131139. 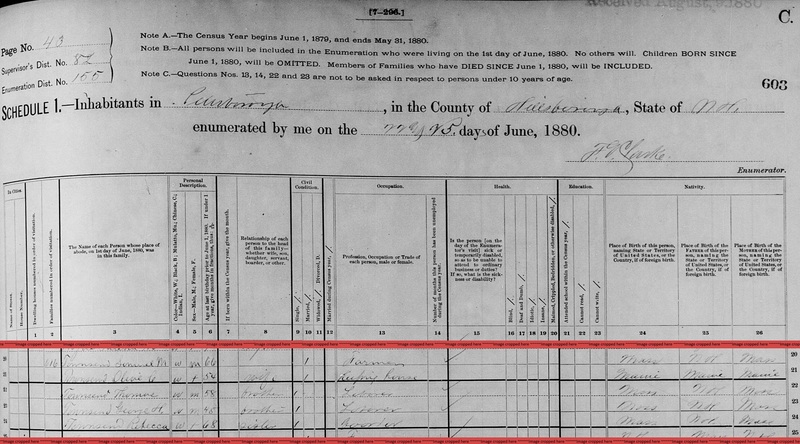 "United States Census, 1880," database with images, FamilySearch (https://familysearch.org/ark:/61903/1:1:MHRV-DYK : 11 August 2016), Samuel M Townsend, Peterborough, Hillsborough, New Hampshire, United States; citing enumeration district ED 155, sheet 603C, NARA microfilm publication T9 (Washington D.C.: National Archives and Records Administration, n.d.), roll 0764; FHL microfilm 1,254,764. 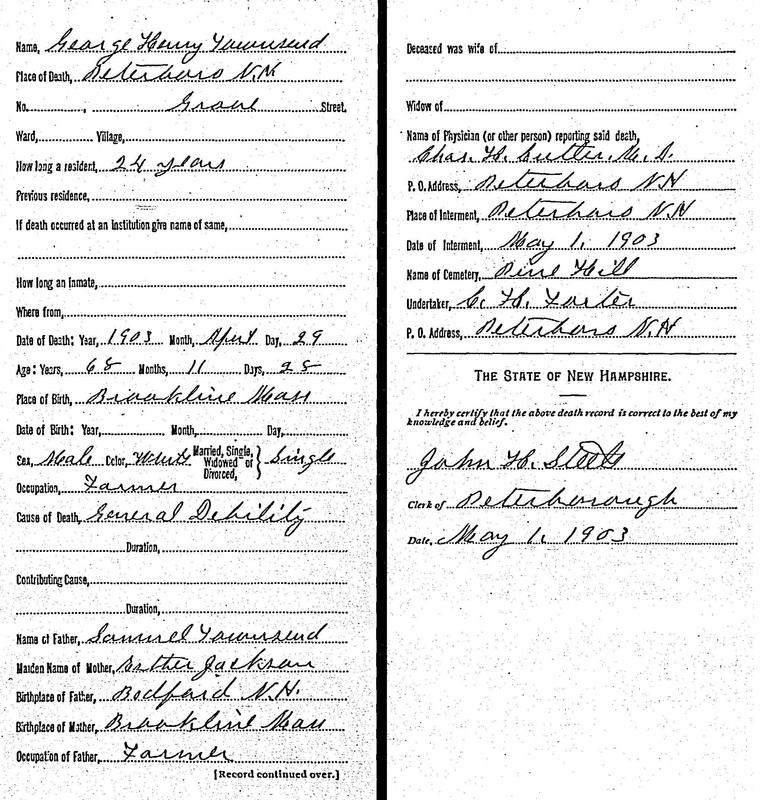 "New Hampshire, Death Records, 1654-1947," index and images, FamilySearch (https://familysearch.org/pal:/MM9.1.1/FSL7-4PV : accessed 22 Apr 2014), Mary Ann Roby, 11 Dec 1896; citing Bedford, Bureau Vital Records and Health Statistics, Concord; FHL microfilm 1001102. "New Hampshire, Death Records, 1654-1947," index and images, FamilySearch (https://familysearch.org/pal:/MM9.1.1/FSL8-22C : accessed 22 Apr 2014), Rebecca Townsend, 12 Dec 1886; citing Peterborough, Bureau Vital Records and Health Statistics, Concord; FHL microfilm 1001112. 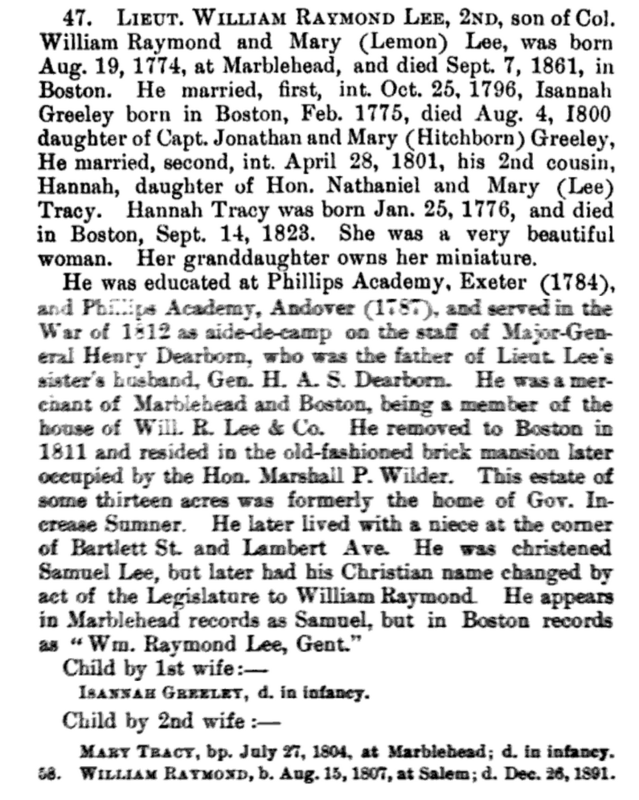 "New Hampshire, Death Records, 1654-1947," index and images, FamilySearch (https://familysearch.org/pal:/MM9.1.1/FSL8-2L8 : accessed 22 Apr 2014), Samuel M F Townsend, 09 Feb 1897; citing Peterborough, Bureau Vital Records and Health Statistics, Concord; FHL microfilm 1001112. "New Hampshire, Death Records, 1654-1947," index and images, FamilySearch (https://familysearch.org/pal:/MM9.1.1/FSL8-22N : accessed 22 Apr 2014), Thomas Townsend, 27 Nov 1899; citing Peterborough, Bureau Vital Records and Health Statistics, Concord; FHL microfilm 1001112. 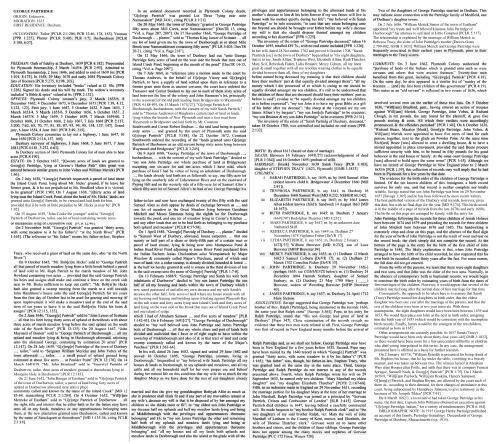 "Massachusetts, Marriages, 1695-1910," index, FamilySearch (https://familysearch.org/pal:/MM9.1.1/FH1V-Y9B : accessed 22 Apr 2014), Samuel Townsend and Olive C. Poole, 05 Jan 1868; citing reference I962-2; FHL microfilm 2031401. "Massachusetts, Marriages, 1695-1910," index, FamilySearch (https://familysearch.org/pal:/MM9.1.1/FH1F-QVD : accessed 22 Apr 2014), Thaddeus J. Townsend and Margaret Feltman, Dec 1875; citing reference I42-49; FHL microfilm 2031401. 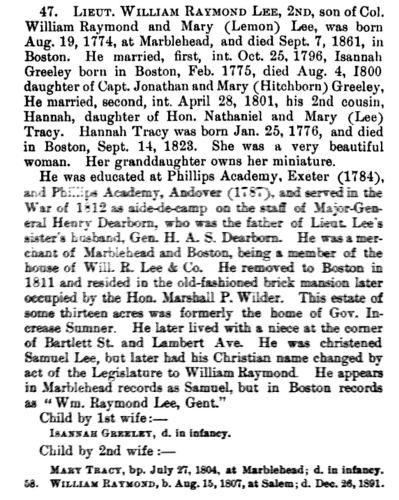 "Massachusetts, Deaths, 1841-1915," index and images, FamilySearch (https://familysearch.org/pal:/MM9.1.1/NW86-DDD : accessed 22 Apr 2014), Thaddeus J. Townsend, 22 Oct 1900; citing Brookline, Massachusetts, 25-236, State Archives, Boston; FHL microfilm 1843728. Thomas Amory Lee, "The Lee Family of Marblehead", Essex Institute Historical Collections, Vol.53, , at https://books.google.com/books?id=K1kMAAAAYAAJ . Salem, Mass. : (1917) , pp. 269-70. Thomas Amory Lee, Colonel William Raymond Lee of the Revolution, , at https://books.google.com/books?id=31wSAAAAYAAJ . Salem, Mass. 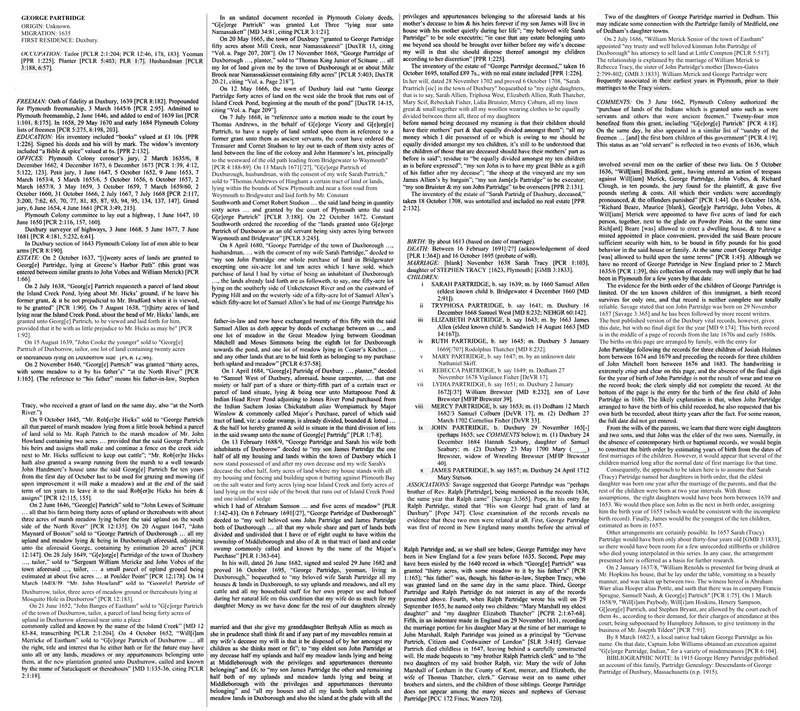 : The Essex Institute, (1917) , p. 28. Refer to this source for additional biography. Edgar Francis Waterman, The Waterman Family, Vol. 1, , at https://books.google.com/books?id=VLhYAAAAMAAJ . New Haven, Conn.: Edgar F. Waterman, (1939) , p. 688-90. Charles Edward Banks, The history of Martha's Vineyard, Dukes County, Massachusetts, Boston: G.H. Dean, (1911-1925) , Vol. 3, p. 571. William Richard Cutter, New England Families, Genealogical and Memorial: A Record of the Achievements of Her People in the Making of Commonwealths and the Founding of a Nation, Lewis historical publishing company, (1914) , p. 137. Robert Charles Anderson, The Great Migration: Immigrants to New England, 1634-1635, Boston: New England Historic Genealogical Society, (1999) , Vol. 5, p. 373-80.